(Nanowerk News) The tail of a seahorse can be compressed to about half its size before permanent damage occurs, engineers at the University of California, San Diego, have found. The tail’s exceptional flexibility is due to its structure, made up of bony, armored plates, which slide past each other. Researchers are hoping to use a similar structure to create a flexible robotic arm equipped with muscles made out of polymer, which could be used in medical devices, underwater exploration and unmanned bomb detection and detonation. UC San Diego engineers, led by materials science professors Joanna McKittrick and Marc Meyers, detailed their findings in the March 2013 issue of the journal Acta Biomaterialia. “The study of natural materials can lead to the creation of new and unique materials and structures inspired by nature that are stronger, tougher, lighter and more flexible,” said McKittrick, a professor of materials science at the Jacobs School of Engineering at UC San Diego. This image shows how joints are connected in the armored plates in the seahorse's tail. Most of the seahorse’s predators, including sea turtles, crabs and birds, capture the animals by crushing them. Engineers wanted to see if the plates in the tail act as an armor. Researchers took segments from seahorses’ tails and compressed them from different angles. They found that the tail could be compressed by nearly 50 percent of its original width before permanent damage occurred. That’s because the connective tissue between the tail’s bony plates and the tail muscles bore most of the load from the displacement. Even when the tail was compressed by as much as 60 percent, the seahorse’s spinal column was protected from permanent damage. McKittrick and Meyers’ research group uses a unique technique that applies a series of chemicals to materials to strip them of either their protein components or their mineral components. That allows them to better study materials’ structures and properties. After treating the bony plates in the seahorse’s tail with the chemicals, they discovered that the percentage of minerals in the plates was relatively low—40 percent, compared to 65 percent in cow bone. The plates also contained 27 percent organic compounds—mostly proteins—and 33 percent water. The hardness of the plates varied. The ridges were hardest, likely for impact protection—about 40 percent harder than the plate’s grooves, which are porous and absorb energy from impacts. The seahorse’s tail is typically made up of 36 square-like segments, each composed of four L-shaped corner plates that progressively decrease in size along the length of the tail. Plates are free to glide or pivot. 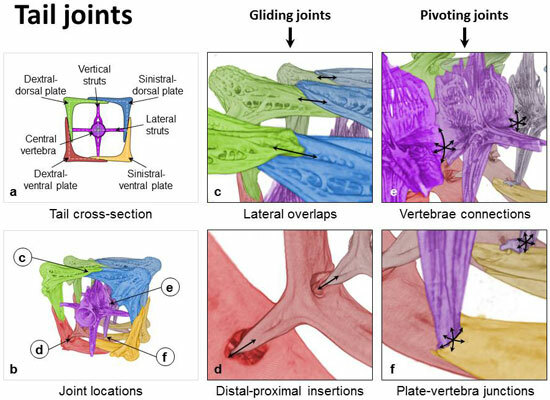 Gliding joints allow the bony plates to glide past one another. Pivoting joints are similar to a ball-and-socket joint, with three degrees of rotational freedom. The plates are connected to the vertebrae by thick collagen layers of connective tissue. The joints between plates and vertebrae are extremely flexible with nearly six degrees of freedom. “Everything in biology comes down to structures,” Porter said.